The Nikon D600 will make its official debut in just a few short weeks and to prepare for its launch, we take an in-depth look at the Nikon D600 features and details. What makes the D600 unique is its potential price position. By packaging a full-frame sensor in a compact DSLR camera body, and pricing it like a high-end crop-frame camera, Nikon hopes to entice hobbyists and enthusiasts from DX to FX. The ability to use a plethora of outstanding FX lenses, ranging from 50-year old vintage manual-focus to modern stabilized zoom lenses, make this camera attractive to many. Nikon has produced F-mount lenses since 1959, all of which can be used on the D600 (although early lenses made through the late 70s will require AI conversion). In addition, Nikon introduced a number of excellent, affordable lenses in the past few months in anticipation of the D600 release, including the 85mm f1.8G, 28mm f1.8G, and 24-85mm f/3.5-4.5 G ED VR, all within the $500-700 price range. In the D600, Nikon delivers the features necessary to make use of all these lenses. Those using older lenses will enjoy the D600’s built-in focus motor that controls AF and AF-D lenses produced without modern AF-S in-lens motors. It also has an AI indexing tab to read the aperture setting on lenses with manual aperture rings (non-G lenses). The feature set of the FX D600 mirrors that of the DX D7000. In fact, the camera is nearly the same size and weight and shares a similar mode dial and button layout. The D600 adds a video record button next to the shutter release and an updated red swoosh above the grip. The top of the grip and shutter release are sloped similar to the D800. The D600 mode dial adds a lock, a feature the D7000 lacks. Otherwise the mode dial shares the same features: Auto, Auto no flash, Scene, user defined modes U1 and U2, Manual, Aperture priority, Shutter priority and Program mode. A sub-dial allows the release mode to be chosen: single, continuous low and high speeds, quiet, self-timer and a mirror-up mode. Programmable function and depth of field preview buttons are found on the front of the camera, next to the grip. The top of the camera houses an internal flash, as well as a large pentaprism to deliver 100% viewfinder coverage. A mono microphone is found on the front of the camera, under the infrared receiver. A lever select manual or auto focus modes, and pressing the AF control button allows changing auto focus settings by rotating the command dial. Because it shares so many features and much of the layout and physical size, Nikon makes the move to FX in the D600 obvious for existing DX owners. When a DX lens is mounted on the D600 it automatically activates crop mode and produces approximately 11MP images. The D600 uses dual SD card slots, with the ability to write data to one or both cards for redundancy. The body of the D600 features weather sealing and a magnesium alloy frame. 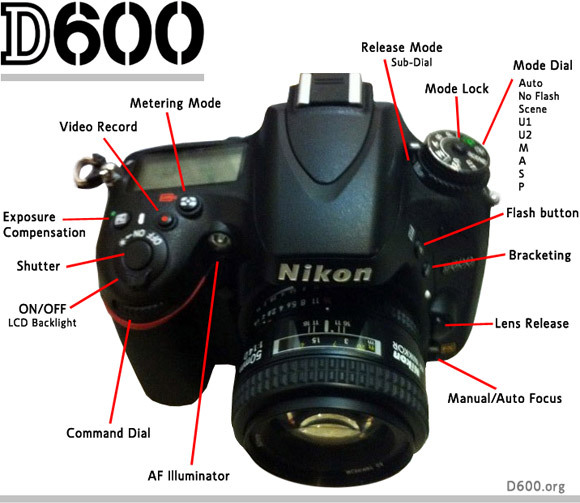 See the full Nikon D600 Specifications for additional information. Advanced features include wireless remote control capabilities when used with the optional WU-1a Wi-Fi Dongle, HDMI video output, 1080p video using MPEG-4 H.264 compression and full time auto focus during video recording. A built-in intervalometer gives control for shooting time lapse photography and the D600 can automatically create a movie from the individual frames. The official D600 announcement will come before Photokina imaging fair in Cologne, Germany, September 18-23, 2012. The camera will be available this fall and you can place a Nikon D600 Pre-order at the retailer of your choice as soon as the camera is officially announced. I have been using a D90 for 3 years and would like to upgrade. 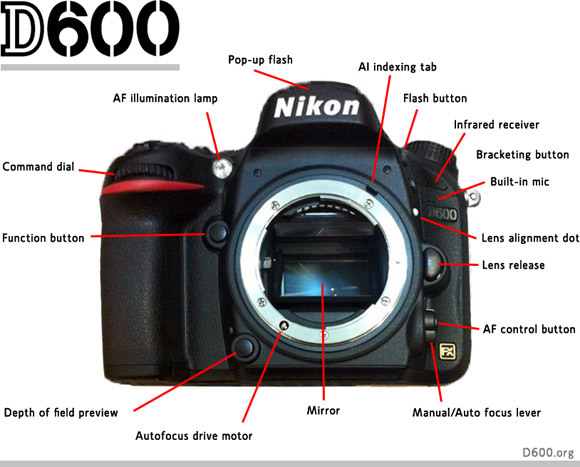 D600 sounds like a good choice.. Let’s hope Nikon keeps it less than $2,000. Hope the rumored price ($1,500) is right.